when the world remembers you exist, and why haven’t you done job x or y yet? This year, today was the day. The first was a customer wanting a job two days early. Now he had ordered months in advance, and we were ready to ship for the day requested. But I’ve so much on at present that bringing forward is actually very tricky. Then another one wanted news on an order, which I could not give him – my colleague on vacation is responsible for that, and then another one came forward asking about an old order, and if it were not made, could he change it? I keep an electronic log book, and record every interaction – it proves very helpful. And I keep the emails, but they don’t always hold the whole story, and in any case sometimes difficult to search.There have been work days where not one entry has been made, and I’d hazard that this year has had by far the most of such days. All this isn’t helped by the utter exhaustion I have felt this year. I really can spend all morning in bed. A few years ago, I’d be up before dawn midsummer walking by the banks of the Thames. There are previous blog enteries here to show that. Now, it’s as much as I can do to get up at all. And I think it is my exhaustion which lies behind the trap described above, that is people leaping on me for not being ready etc regarding work. And then I have the car to work on – feeling exhausted before I start. Currently waiting for a part from MB that was hiding in an unheard of MB dealership in Germany to be shipped to me. I’ve often started writing an entry, but never completed it, or it was too short. But then I came across a blog where the author had the same issue, but he just tagged two or three random ones together to make an entry. So why not? And the blog title – taken from a Wodehouse book of short stories. This was a specific brew, made from fruits from the garden of my childhood (and present) home, before we went on holiday to SE Devon. Principally it was made of Loganberries, but would include, from over the years, Rhubarb, Gooseberries, Redcurrants, Strawberries, possibly an Apple (Discovery) and maybe others. Sour cherries (Morello) probably were not included, as I think it would have been too early for them. But the vital point was that it was made in mid July, too early for most fruit, and I stress, just from the garden – well, not the sugar. Usually we managed to make 3 or 4 pots of the jam, a couple of days before we set off. In the early years, brother and I would be in blankets at 05:00 in the back seats of Mini (the original 1959 type), our “toys” in the side pockets and meals in bags/boxes between us, everything from 06:30 coffee in flasks to mid afternoon tea. Without motorways, that is how long it took, especially trying to avoid traffic black-spots. The Holiday Jam would be first opened on the Sunday morning, the first morning in whatever caravan we were in, served with toast. From Monday onwards, there was the possibility of cooked Mackeral with toast, caught from a village improbably called Beer, where traders hired out inboard motor boats for tourists to go line fishing. It was my experience of making this jam that meant that when I had a chance to make some raspberry jam a few years ago (as recorded in this blog), I was able to do it successfully without the paraphernalia apparently needed for modern jam making. These days, I’m essentially an engineer in my day-to-day life, but I have a background and some training – sadly ill-used – in music. It has lead to some odd situations, as if odd situations don’t hunt me down. This time I was invited back to a friend’s place in the Uni Hall of Residence after an evening at the bar. I don’t recall quite how we got to this situation, but the coffee and brandy were flowing, and he must have known my background to some extent. So he put on a record, and challenged me to name the composer. It wasn’t easy, I didn’t know the work, but eventually I decided it was essentially Handel, but with a more recent spin, to use the current terminology. Arranged Elgar, I suggested? As it turned out, I was absolutely correct. “I’m impressed” my friend said, clearly was. He didn’t realise that the science departments were able to raise string quartets, bands, and in one case a science facilty small orchestra. Though things are bad if I end up in the first Violins. There have been few musicians interested in science, but on one occasion I took a couple through a tour of my department, which impressed them. Especially the X-ray diffraction, which I had painfully learnt how to orientate metal crystals by reading the X-ray photos – so was able to bore on with impressive bluffing. I have it on good authority that people now blog from their mobile phones. I struggle to imagine how they manage on such a tiny keyboard. I grew up on real type-writers, such as the Imperial 66. Indeed, while at Uni, there were plus points for type-written reports as opposed to hand-written. I well remember the night I put aside to type my first (typed) report. The Imperial 66 I purchased for £45 (how expensive! ), was set up, me thinking it would take me literally all-night. Despite the mistakes, with tipp-ex paper to hide some of them, it was 03:00 by the time I finished, and gladly sank into bed. I still have it, and although the usage has decreased, it is still in weekly use. Perhaps 15 years ago one woman, seeing my typed airwaybill said “that’s an old-fashioned type-face”. I was surprised as she was quite young. Only last month did typing waybills finally fall off its rota, serial numbers on thin metalised labels are the last remaining redoubt. 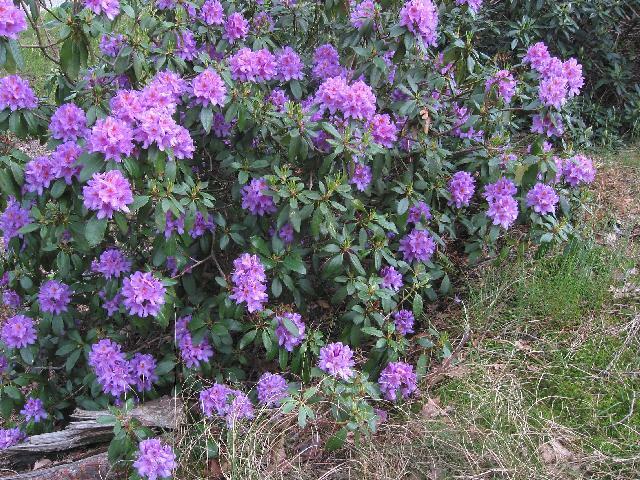 The hills are alive with the purple of this Rhododendron. When my favoured route to Tescoville used to run through Slough, this time of year one really was driving through groves of this stuff, purple on both sides of the road. My favoured route has changed, and while it’s not quite as common, it’s still very notible. Favoured route here means a route to take when the M25 is completely clogged up, which is most weekday evenings. A couple of years or so ago, at this time of the year, a group of us went to a car breaker based in Yorkshire. One of the group looked up at the hills and admired the colour of the Heather – so I had to correct him in that the colour now was Rhododendrum runaways, Heather didn’t come out until August. For reasons of my father being a Beekeeper, and one year I helped out in a general treck taking the bees up to the Heather moors (in the late 1980s), I knew the Heather starts in August. Bees are taken there partly as the main crop in the South of England has ended, and partly because Heather Honey is widely praised. It also has some interesting physical properties – it is thixotropic, for a start. Hum, interesting rare word used in English containing the letter “x”…I digress. It is amazing just how invasive plants have come to dominate some areas. (This is also true for insects and even some Deer species). Red Valarian is a pest in Tescoville, as indeed is Japanese Knotweed, I remember seeing it in the town centre in the 1970s, and it was a pest then!. Fortunately the latter is nowhere near anywhere of my responsibility, though there are enough other pests to keep me occupied. I did try and kill off a clump when I rented a house in Cambridge, but wasn’t there long enough to know whether I’d even killed off the lot in the garden let alone everywhere else in the area. Rhododendron is a pest in the woodland in the greater Tescoville area, but also all around the country. At the moment, I have more than once source of embarrassment – apart from my spelling that is. (I had to check the spelling of the title, and it was wrong for the usual reasons my spelling is wrong – a wrong vowel, and didn’t double one of the constenants. But I’ll discuss the current worse one. I have an invitation to a 3 day symposium to honour my former supervisor’s 70th Birthday. It’s in the summer. I have seen the speaker list, and it is packed with people I knew well while I was studying. They are all now high-flyers in their field. I’ve not seen the list of attendees, but guess that’ll be packed with many more. Now there is more than one reason I strongly hesitate to even acknowledge the emails. What is worse, as I’m invited, I don’t need to pay the symposium fees (other than a Dinner). I cannot even plead poverty! Firstly, I’d fall asleep in the lectures. I would do that when I was an undergraduate, so add thirty odd years, and I’ll be out like a light in seconds. And unlike my undergrad days, I probably won’t understand a word that was said, and thus trying to make notes (the only way I kept awake) more than pointless. Secondly, I’m now just a dowdy manufacturer, who has supplied equipment to a few of them. If I showed up, they’d think I was there to try and flog tackle. I could not make any useful contrubution to the symposium. Thirdly, a few of those who might attend are no longer friends of mine – that is to say some I’d like to throttle, some I’d just prefer we never met again. What is worse is that I’ve kept in contact with said supervisor, helped him and his group out on various occasions, such as supplying goods at cost price (in the forelorn hope of future orders), and including a recent one involving a third party company, whom we would not supply as we doubted we’d ever be paid (that condition still exists). But by our friendship etc, a solution was arrived at, and they got their equipment that otherwise they would have lost their deposit over. So I’ll be damned if I go, and damned if I don’t. Wonderful. In the film ‘The Blues Brothers (1980)’, one of the many chase scenes involves the by now crippled ex-police car of the brothers being chased by Illinois Nazis. 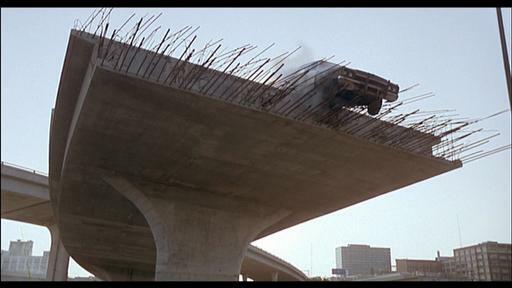 They run through road-works, and end up at at the end of a partially constructed roadway – they literally run out of road, and the car hangs over the edge. Many years ago, in Germany on business, in a ‘company car’ (in fact one of the directors, loaned to me). I was not in my car, on the grounds that my then 20-year-old Volvo wasn’t up to the job (sic). Never had power steering, the servo for the brakes had failed (but still passed the MOT, the brakes worked). Anyhow, due to the Bayreuth festival, hotels in that town were sold out months in advance, so we found ourselves out, literally, in the middle of nowhere. My companion was a younger man of dubious sexuality – such that I slept on the floor on the first night out, in Heidelberg, he had the bed in the only room we could find that day. This was despite his attempts earlier in the day – although he had had plenty of offers of a bed from [or more probably with] various women (sometimes plural) he approached in the attempt to find somewhere (only I was in tow…) He certainly was a ‘Buon Uomo’ (if I’ve got that right), and would top up his sun-tan at every possible moment. But these offers were further complcated by the fact that we needed secure parking for the car at that time, because of the goods we were carrying. His navigational skills were notible by their absence. At one point, earlier in the day in question, we found ourselves in the then still existing East Germany. Since the car was travelling TIR, and we were now in a country not listed on the forms, we’d be in trouble if anything when wrong. So late this night, with his at best iffy navigational skills, I found that I had to do a 3 point turn. Only I didn’t succeed – there was a ditch rather close to the road, and the car ended up askew nose down in the ditch, at 2 O’Clock in the morning. As I looked at the situation, I thought I found a way out. By jacking the car up on one side, enough to put the spare wheel under the chassis, would equalise the problem (so long as it didn’t slide down further). That worked. So getting my colleague to stand on the rear bumper, and jump up and down, while I, in the driver’s seat, tried to reverse – it worked – the car pulled itself out, scraping along the spare wheel. The alternative would have been walking to a farm, getting the farmer up, to get his tractor out and pull the car out of the ditch. Fortunately my colleague spoke good German, so there was not that hurdle to overcome, but I didn’t look forward to the prospect. This ‘getting a car out of a ditch at two am with a spare wheel and physics’ is one of my my better stories, it is also one I cannot tell to friends and family – for getting the car in the ditch in the first place, to the owner of the car, or to my family who’d worry what I’d do next. The news of the Eastman Kodak ‘filing for bankrupcy’ to use the American phrase, is being played out as the death of film photography – at least for the everyday user. I’ve not put a link in here on that at present, as most of them listed on Google seem ephemeral. It is certain that most people now have digital cameras. Even I haven’t taken a film photo for at least three years, and I’ve taken far more photos since I had a camera in a mobile phone than I did before. (Sadly, that camera seems to be beginning to fail). Before all of this, I had decided to digitise my entire photo collection. I purchased a device that takes the negatives, converts them and stores the image on a memory stick with 9MB resolution – the highest I could find (as of the time of writing). I grabbed a set of old negatives, which were of the London North Eastern Railway (LNER) engine Mallard when it ran through my home town in the mid 1980s. 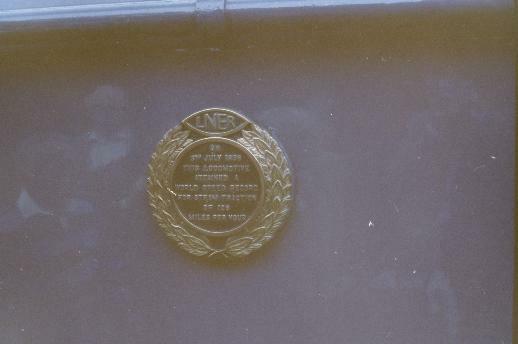 Of course I have family ties with the LNER, so it was a special occasion for me. It stopped at the station, I had obtained a platform ticket (remember those? ), and took some photos. However, in viewfinder, something I’d never seen on the print; reflected in the engine’s paintwork was the face of my late father. 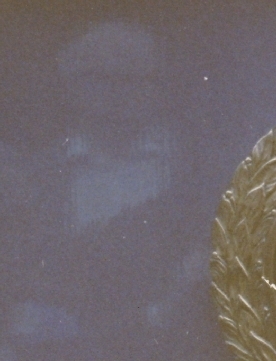 I’m unable at present to enhance the picture sufficiently, the best I can on this computer is the following image, which at least looks like a head and open-necked shirt. Of course, looking back at the first image shown here, there is a shadow that, knowing what I know now, I recognise, but until that moment, I had not a clue. Believe me, in the viewfinder, the reflected image is unambiguous! 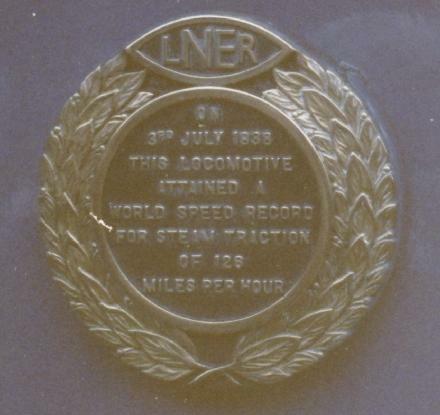 This engine, with an official speed measuring truck in tow, managed to reach 126mph for just long enough to count as the world record holder. A record that still stands to this day. This is item one of this topic. One should not be surprised that I take some time to compose some blog entries, for they require a fair bit of research, for all their lack of references. One of the entries that I will make on this topic is already in a fair state of preparation, but I have to scan in images, work on them (sic) to highlight the issues I want to discuss. Another topic will be the lifetime of digital imagery, as opposed to those of negatives. While I have never been a Boy Scout, I do try and uphold their motto “Be Prepared”. Or perhaps in some other wordings of such an attitude to life, such as “Expect the Unexpected” (from Hitchhiker’s Guide to the Galaxy), a wording that has on occasion saved great embarassement or worse. This is the reason for my Out Bag, and that, so far as I can remember, I have continuously carried a pocket knife since schooldays. I cannot remember what age I was regularly carring one, I assume it was school age at some point (that would not be allowed today). I’ve only lost one – and I certainly believe lost not stolen – at University. I rememeber having it, which room but a day or so later I realised it had gone, and despite quite a search (I was also leaving, so was packing up), never found it. That still irritates. there and had carers come in to keep an eye on her. More recently, issues such as trouser pockets not being so strong as before, the need to carry many more keys with me, needing something to cut finger nails (with growing age, my nails tend to break more easily, and hence need to be trimmed ‘on the go’). So I picked upon the standard ‘vanity’ Swiss Army (Victorinox) type. I use the word ‘vanity’ in that it is for cutting fingernails etc, as the primary function, although it was the Classic SD Mini knife. This knife lasted well, but apart from some design features, below, my tendancy of dropping my keys meant the red plastic sides – ‘scales’ – were breaking. For a short time after that, I carried a larger Swiss Army knife, but basically it proved to be too big – much though I liked, and used, the extra blades, the corkscrew proved to be the most useful additional part. So we come to the recent knives. Having had the side plastic – ‘scales’ break, I looked for an alternative, and found a special Victorinox version of their Classic Mini with knurled alox handles. Notibly more expensive even though it had fewer features, it was the metal sides I was interested in. 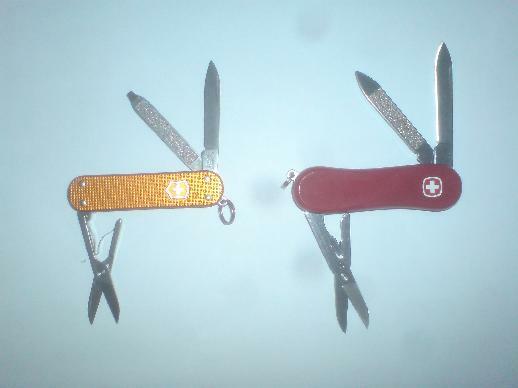 There was also the Wegner equivalent of the Victorinox Classic, which had the larger plastic scales, although in this case profiled for better gripping. I should note both of these knives took some time to find, they certainly were not available in high-street shops whenever I looked. For various reasons, having the knife on my keyring became a requirement, and here the two knives show their relative merits and problems. The (in this case orange) knurled alox handles make for a much smaller physical knife, for the same size blade. But the design means that operating the knife means having the rest of the keyring attached half way down the knife – the Wegner knife has it at the other end. 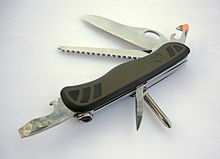 Due to its slim design, this particular Victorinox knife does not have the toothpick or tweezers (the Wegner does – and internally mounted, not externally as per the standard Victorinox ‘vanity’ knife with the red plastic scales). It is interesting to look at what knives were actually issued to the Swiss Army. From the 1960s until recently, they had knurled alox handles. 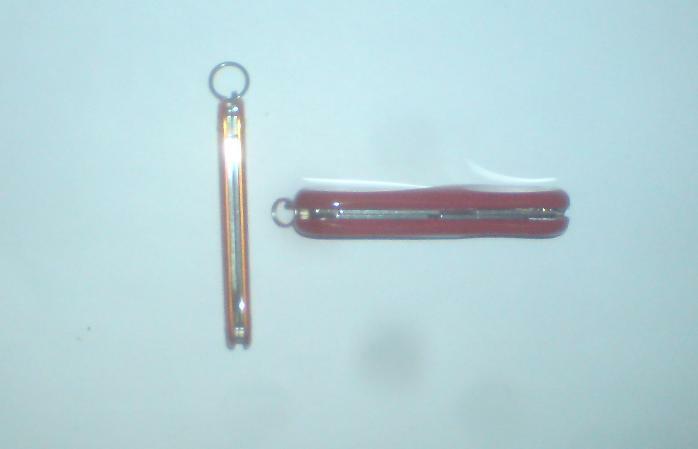 The most recent model has “polymer texturized non-slip inlays incorporated in the nylon grip shells” (from Wiki), but it is designed to be keyring mounted – and the keyring is at the opposite end to the opened knife! So I guess my ideal knife for this purpose would be of the general Victorinox knurled alox design. but with the Wegner keyring location, and even possibly the internally mounted tweezers like the Wegner. But (and here is the dumbing down), why did Victorinox design a knife with the keyring in such a stupid position in the first place? While I do use the knife for the ‘vanity’ purposes that I alude to, I’ve used it to re-wire a mains plug (actually, that is an illegal act now…), cut paper, wood… But I’m not so popular now as when I had a corkscrew on the knife.